Beaches eroding world-wide from devastating storms, sea changes, and human use. Rising sea levels are quickening the pace of beach erosion around the world — endangering coastal cities + shoreline habitats. Building oyster reefs can help restore beaches and create new habitats, even as oceans rise. The special construction of the concrete blocks used in the break-water’s blueprint: includes circular indents where sea life can take root and re-build lost habitat. The living breakwaters project was crafted by the landscape architecture + design firm Scape — as part of a professional blueprint competition called Re-Build by Design, sponsored by the Dept. 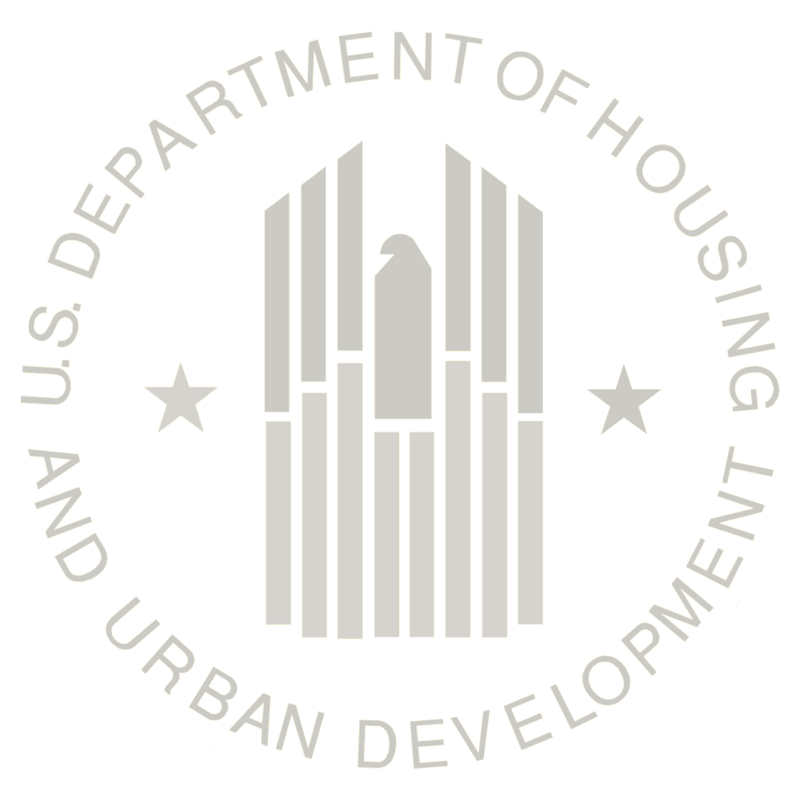 of Housing + Urban Development • United States. The elite competition called on top engineering firms to submit design proposals that solve major ecological, shoreline problems caused by humans + natural disasters — such as recent super-storms. Engineers explain that today’s increasing super-weather — plus the extreme use of world beaches by people — call for futuristic feats of engineering to save the shoreline’s cities + habitat. 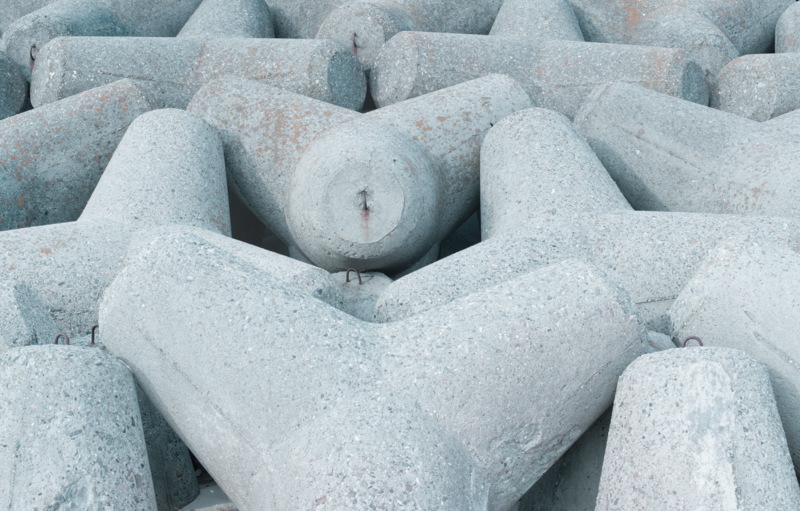 Concrete blocks called tetrapods — with an inter-locking shape — used for building modern break-waters. The living break-waters project is an innovative, coastal green infra-structure plan — designed to reduce beach erosion + damage from storm waves, and improve the health of the delicate, shoreline eco-system. The project also encourages the community to become good stewards of their neighborhood’s coastal zones. The project’s design is a living infra-structure that installs a necklace of break-water barriers — to buffer neighborhoods from wave damage + erosion while providing a bio-diverse habitat for juvenile fish, oysters, and more sea life. The plan is being implemented by the state of New York — with $60 million in funding. It’s currently in the schematic design process, moving into construction this year: 2019. 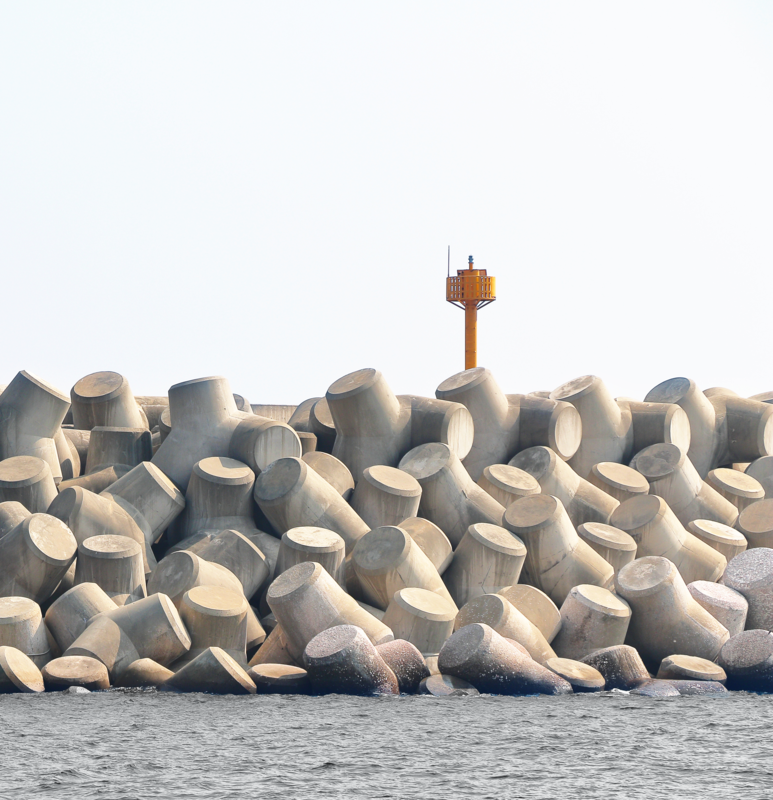 These high-tech concrete blocks called tetrapods are often used in engineering modern break-waters along coastal shorelines. 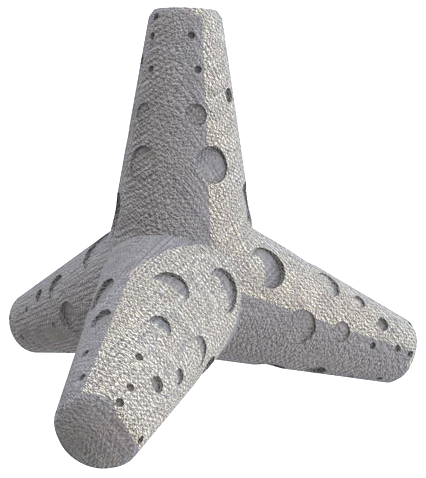 Concrete tetrapods were designed to remain stable under the most extreme weather + marine conditions. When they’re arranged together in lines or heaps, they create an inter-locking, porous barrier that dissipates the power of waves and currents. 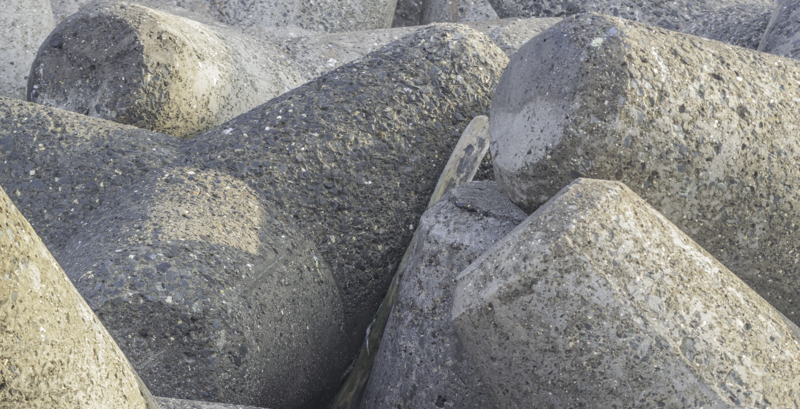 Large concrete blocks called tetrapods can be stacked side-by-side + in layers to form an inter-locking mesh — and laid-down in wide fields along shorelines to prevent erosion caused by weather and long-shore drift. 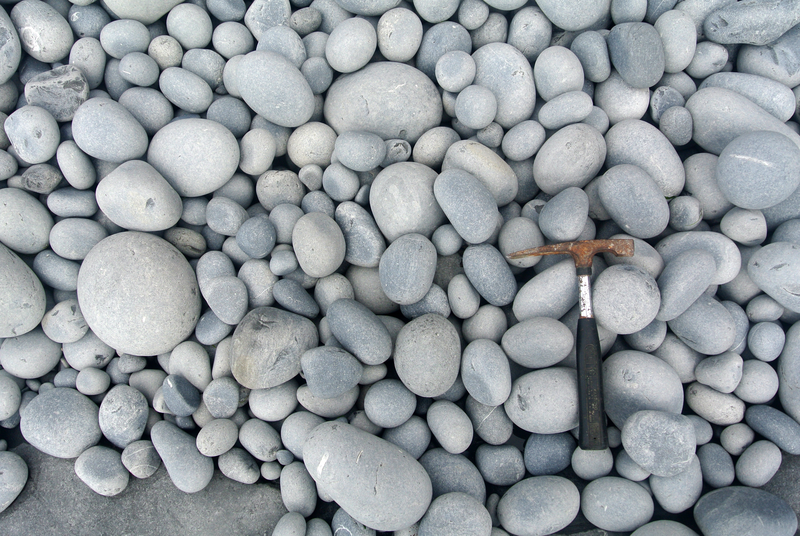 Tetrapods are used by landscape engineers to re-inforce coastal structures such as seawalls and break-waters. 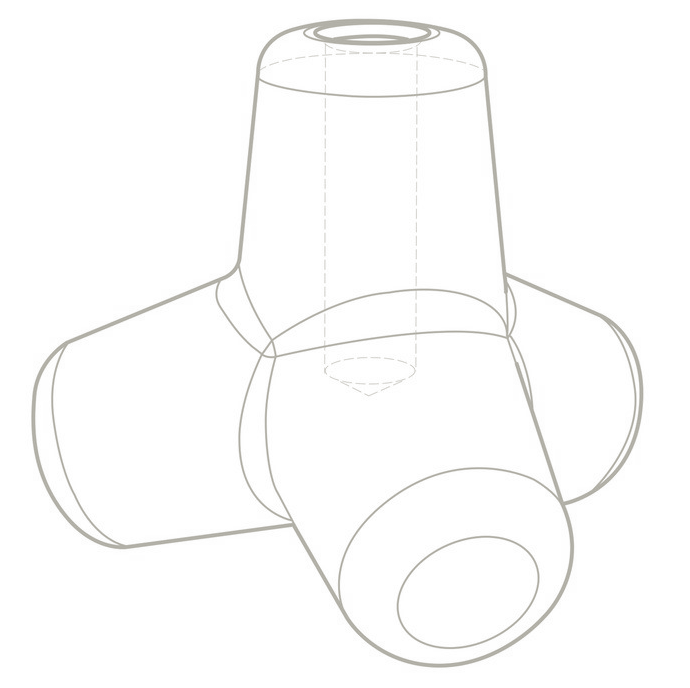 The tetrapods have a tetrahedral shape to dissipate the force of incoming waves — this special shape helps water to flow around the blocks instead of against them. The inter-linked web they form keeps the blocks from being displaced. Coastal engineers survey beaches and dunes to draft blueprints for building shoreline-saving structures — like specialty overlooks for sight-seeing that don’t interfere with ecology, and break-waters made of high-concrete blocks. Drift from long-shore current is a geological process: it means the movement of sedimentary rocks — clay, silt, sand, and shingle — along the coast, parallel to the shoreline. Incoming wind squeezes water along the coast, generating a water current that moves parallel to the coast. So long-shore drift — also called beach drift — is simply the sediment moved by the long-shore current. This current and sediment movement happen inside the surf zone. 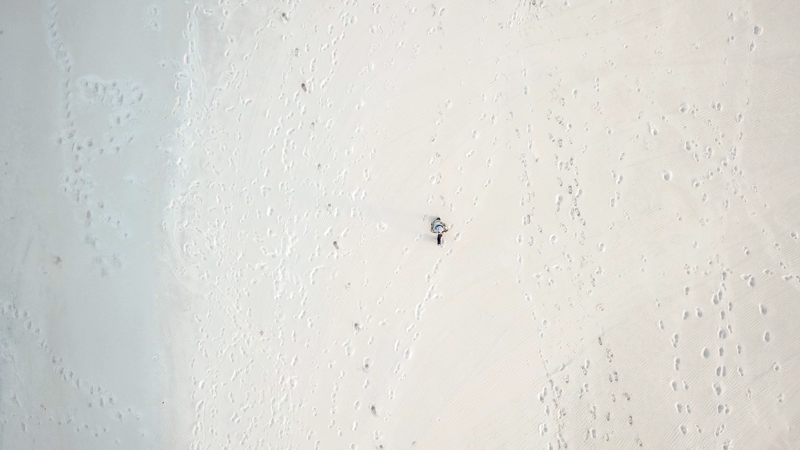 Beach sand is also moved on windy days — from the swash + back-wash of water on the beach. Breaking surf sends water up the beach (swash) — and gravity then drains the water down-slope (back-wash) perpendicular to the shoreline. 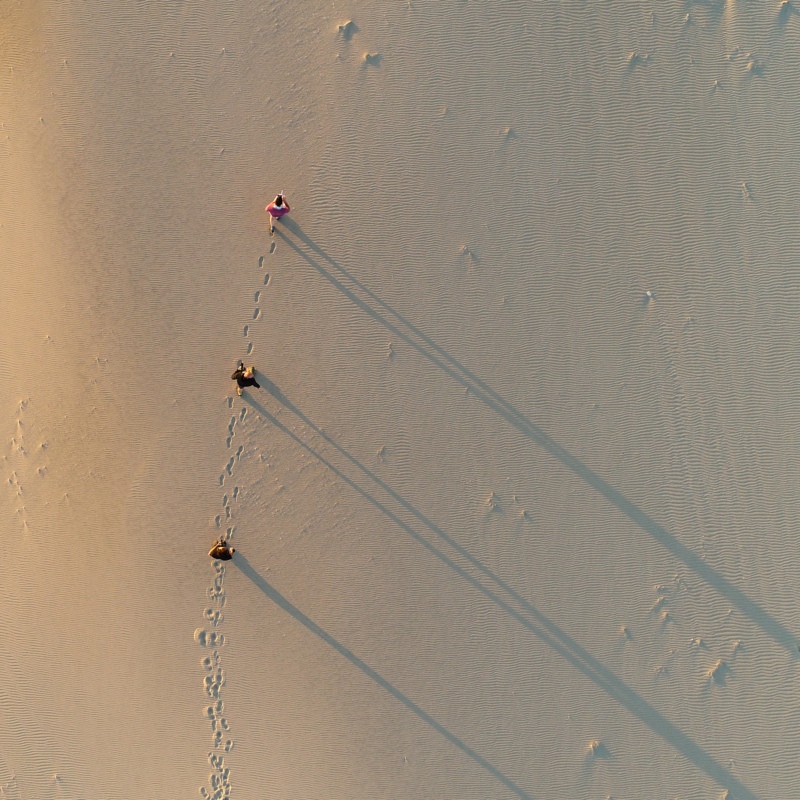 Beach sand can move down the beach in a zig-zag pattern, 10s of meters per day. This causes a constant stress of erosion that takes time for nature to re-build. In cases of human-made shoreline disaster or natural storms, dangerous erosion happens much faster, threatening coastal civilization — as well as sea life + plant life habitat. The United States • Environmental Protection Agency estimates that between 80 % — 90 % of the sandy beaches along US coastlines have been eroding for decades. Many beaches are losing several inches per year. But in some cases the problem is much worse. The outer coast of the state of Louisiana — called an erosion “hot spot” — is losing 50 feet of beach per year. ReBuild by Design — a landscape architecture + urban design firm — is re-imagining the way communities find solutions for today’s large scale, complex problems. We convene a mix of sectors — government, business, non-profit, community organizations — to see how overlapping environmental + human-made vulnerabilities leave cities and regions at risk. Our core belief is: communities grow stronger with collaboration, prepared to stand-up to serious challenges. 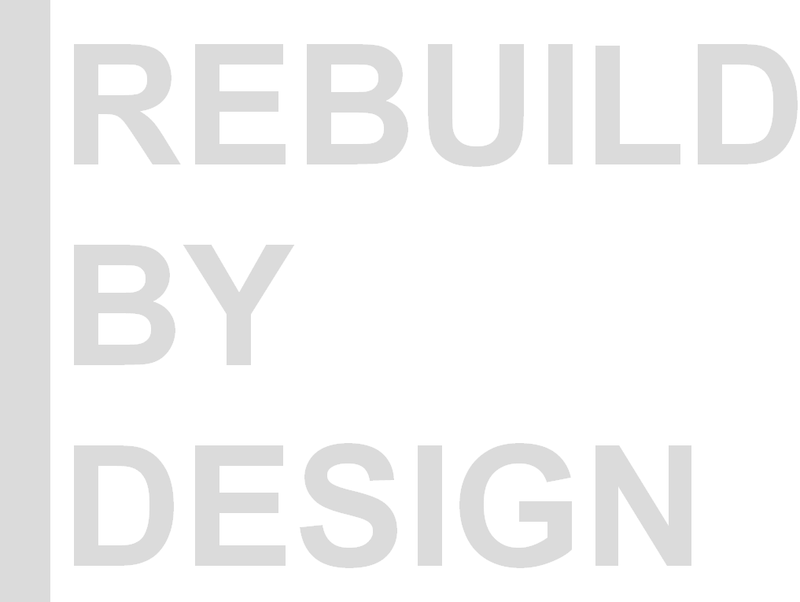 ReBuild by Design began as a design competition, launched by the United States • Dept. of Housing + Urban Development — in partnership with non-profits — in response to hurricane impact. The competition became a model to help government. deck: Is beach erosion a natural cycle? deck: Or is it getting worse with rising sea levels? * Scientific American magazine by Springer co.
* Fudo Tetra is Fudo Tetra co.
deck: Beaches eroding world-wide from devastating storms, sea changes, and human use.